Dropping your IPad on the power connector while plugged in is bad, doing this when we’re 300 miles away from the nearest Apple Store is also not so good… but buying Apple Care Plus at the time of purchase guarantees a replacement (even if dropped) for a modest fee, not so bad. After an overnight in Ridgway, we arrive at Rifle Falls State Park. This is a tiny 13-space campground and is very popular. When we check in, the campground host tells us that we only got our space because of a cancellation and we probably booked within the hour of cancellation. WOO HOO Lucky us. The campsites are along the main park road, so there’s some foot and vehicle traffic during the day but the nights are really quiet. The sites have water and electric. 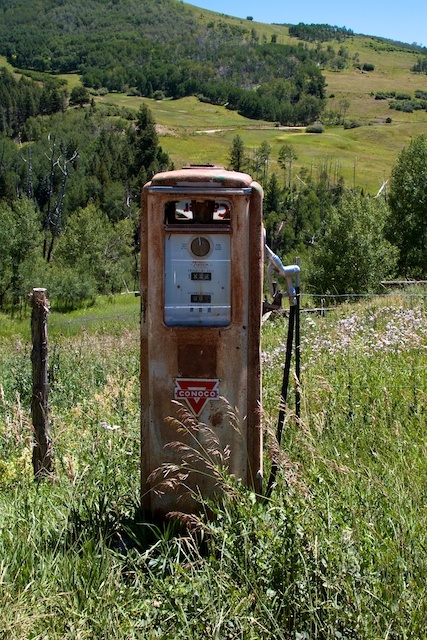 The closest dump station is down the road at Rifle Gap State Park. 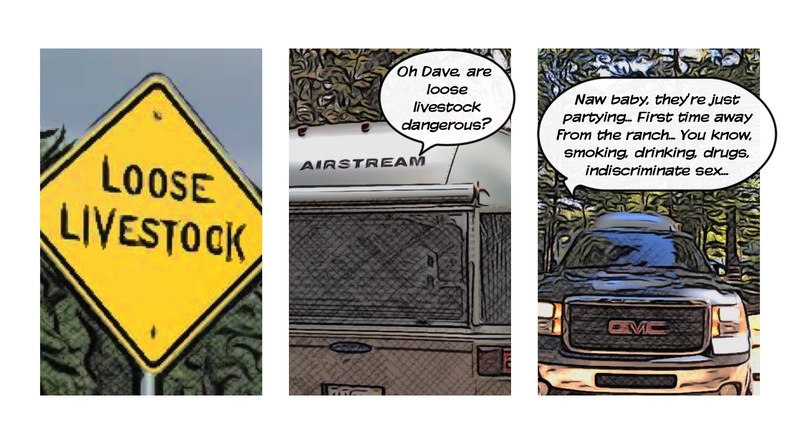 It is an easy walk to the falls and hiking trails from our spot, so Dave gets to park it while we’re here. 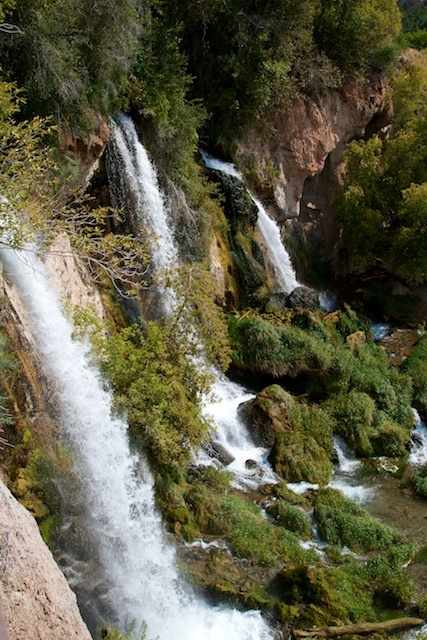 Rifle Falls is one of the few triple falls in the country and the only one in Colorado but this is not a natural occurrence. The original falls fell in a single, wide arch over the limestone cliffs. In 1910 the town of Rifle built a hydroelectric plant, which changed the flow of Rifle Creek into three separate falls. 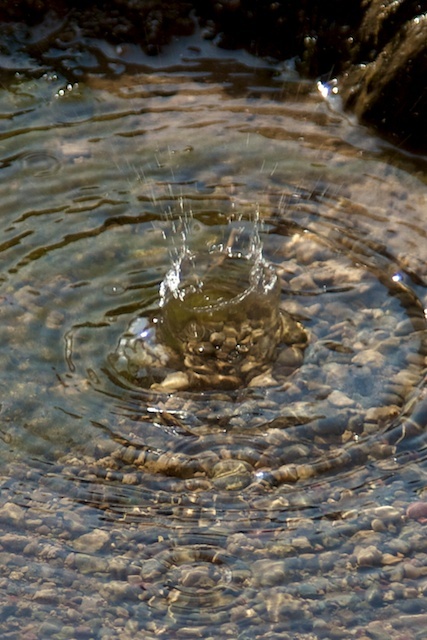 One of which, flows out of a large metal pipe. So the falls may not be natural; but they are nevertheless, stunningly beautiful, a rainforest oasis in the high desert. 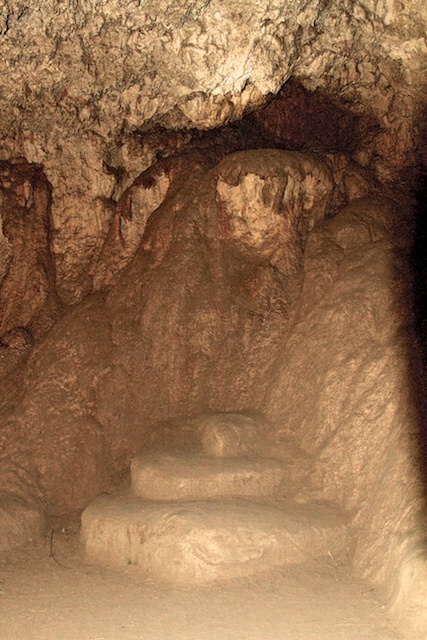 Caves and alcoves dot the limestone cliffs around and behind the falls. 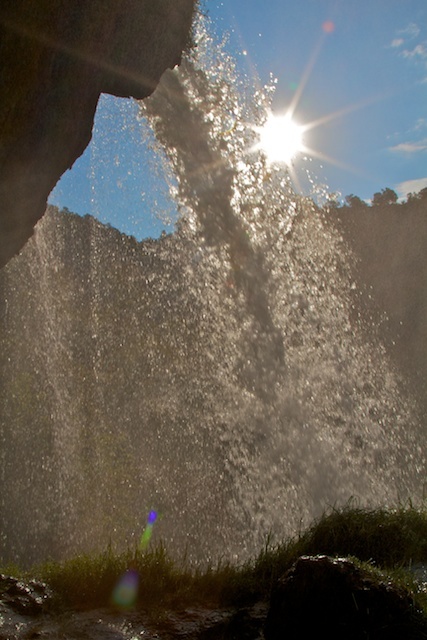 There are hiking trails to the top of the falls, with a walkway along the cliff edge over the falls. A loop off this trail winds across a meadow with artificial fishponds that are stocked and open to fishing. These ponds are part of the Rifle Falls Fish Hatchery. There is a trail from the bottom of the falls to the fish hatchery. We hike to the hatchery from the ponds and return on the Hatchery Trail. 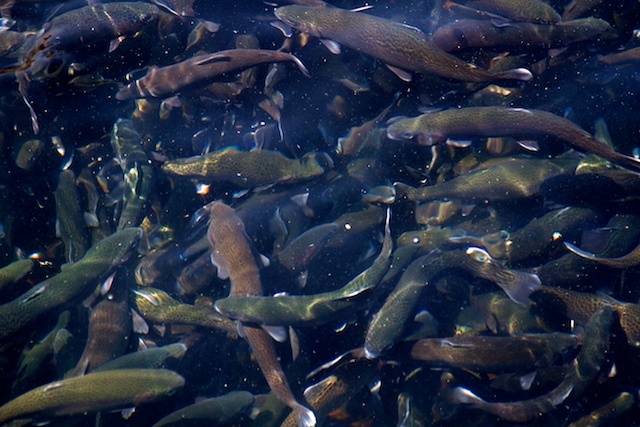 When we get there the hatchery office is locked, so we just walk around and check out all of the trout in the tanks. And read the displays about how the fish are planted: pumped out of trucks, dumped out of planes and back-packed into inaccessible lakes and streams. We take care of business at the Apple store – New IPad for Chris . 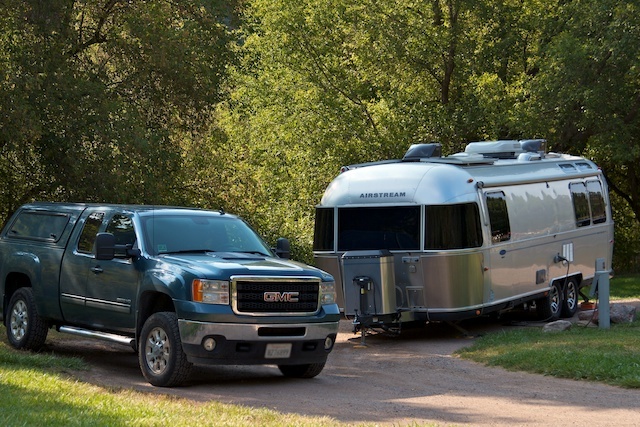 We also visit the nearby Camping World and pick up a few supplies. Now it’s back to Fruita and start thinking about heading southwest. Moving further south in western Colorado we stay at the Priest Gulch Campground on the Dolores River. The high altitude here means lower temperatures. Most of the folks here are “seasonals” from Arizona and Texas who return summer after summer to escape the heat. But there are few spots that can be rented for a shorter term. Our spot across the river backs up to a mountain forest. We have full hookups, the WIFI is pretty good, and there’s a nice laundry facility. 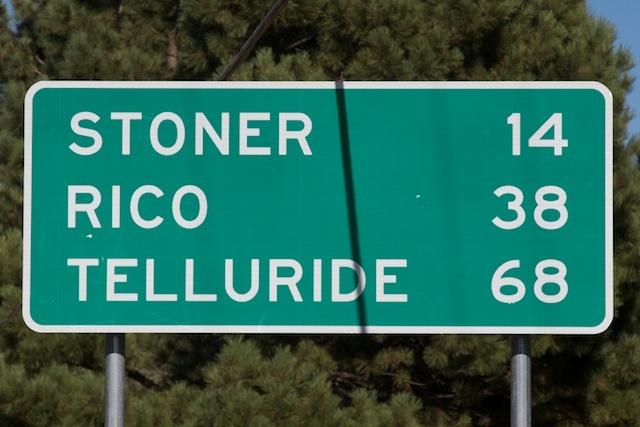 It is also centrally located between Cortez in the Four Corners area and the ski areas of Mountain Village and Telluride. 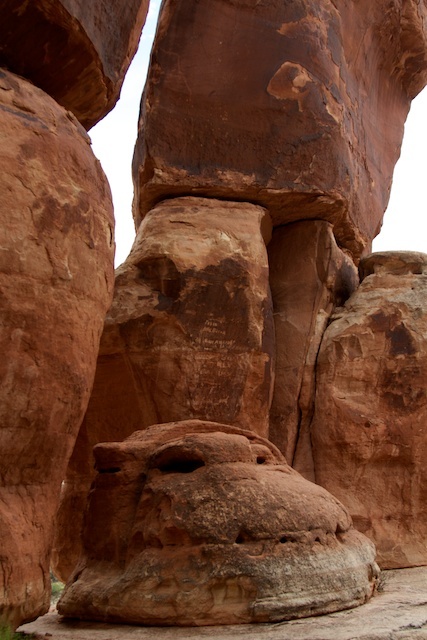 We visit the Anasazi Heritage Center in Dolores. This is also the visitor center for the Canyon of the Ancients National Monument. They have a nice little museum with artifacts and theories about the Ancestral Puebloan culture. Up the hill behind the visitor center overlooking the Dolores River Reservoir, are remains of an Ancestral Puebloan Village. From the top of the hill we have a 360° view of the surrounding area. We see Sleeping Ute Mountain, the San Juan Peaks, the towns of Dolores and Cortez, the river, high desert and farmland. In the Canyon of the Ancients NM we visit the Lowry Pueblo. 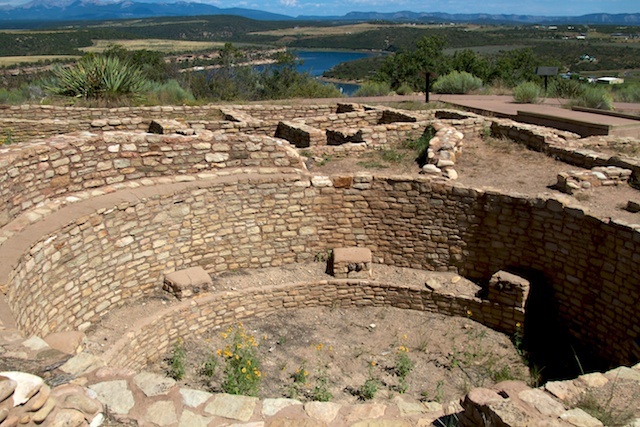 This is the site of two exceptional Kivas. The Painted Kiva still retains traces of the original painted plaster. When first excavated this kiva had a beautiful painted mural on the wall. Efforts to preserve this mural in place failed. A small section of the mural was removed and is on display at the Anasazi Heritage Center. A modern steel roof protects what’s left of the mural, but today it is just bits of plaster clinging tenaciously to the rock walls. 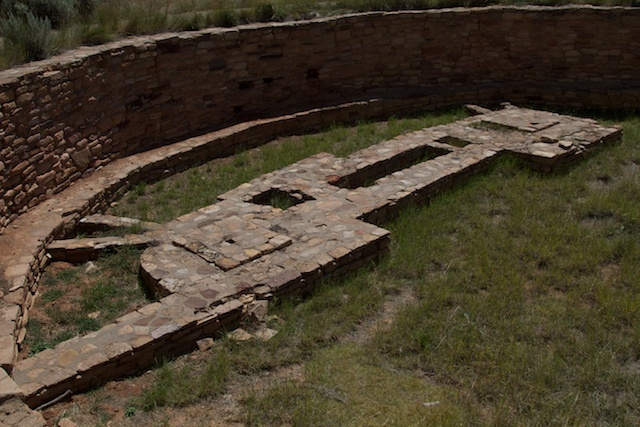 The Great Kiva is 47 ft in diameter and one of the largest kiva’s found in the area. 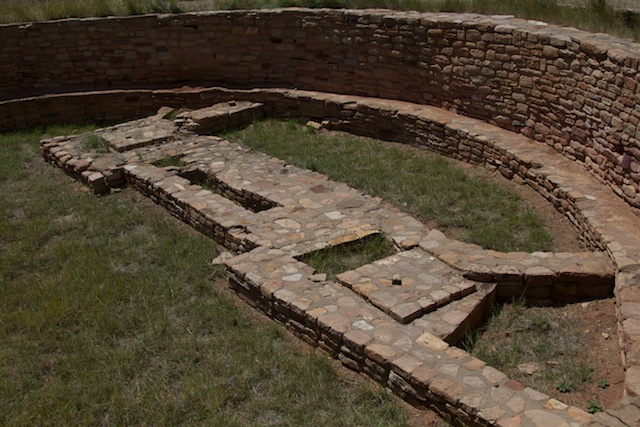 Modern Pueblo people identify the structures in the bottom of the kiva as representing winter people and summer people. A free public gondola connects the towns of Mountain Village and Telluride. It runs from 7:00AM to midnight daily. The system is dog friendly and paw prints mark the cars available for folks traveling with their canine companions. Mountain Village has a large public paid-parking garage near the gondola terminal; it’s convenient and only $7 for all day parking. This is the green way to travel: paying for fuel and driving for 20 minutes to cover 8 miles vs. parking and riding for 13 minutes on a free solar powered gondola. Mountain Village and Telluride are bastions of wealth. The economy is based on high-end tourism. Houses here cost in the millions so it’s no surprise that the towns have their own gondola system to move residents and tourists between the towns and up the mountains to the ski trails that double as hiking and mountain biking trails in the summer. Telluride still retains the feel of a gold rush mining town with colorful Victorian houses, red brick buildings and clapboard storefronts. The shops are mostly high end. Bars, breweries, restaurants, galleries and boutiques fill the business district. No cheesy plastic bags for customers, even the Ace Hardware provides heavy paper tote bag to haul the few maintenance supplies we pick up. 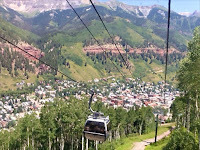 Telluride is also known as a top foodie town. Unfortunately we only have time to make one stop. We grab a couple of pints on tap and an order of eggplant fries, (panko crusted, fried to perfection and dusted with savory herbs) at the Black Iron Kitchen and Bar. The beer is cold, the fries are tasty the service fast & friendly, and the ambiance welcoming. Mountain Village is more of the bedroom community with resorts, vacation homes and condos. Guests of the Mountain Village Resort can play the Telluride Mountain Village Golf course. A 18-hole 71-par, 6,739 yard course tucked within the highest concentration of 13,000 and 14,000 foot peaks in the United States. 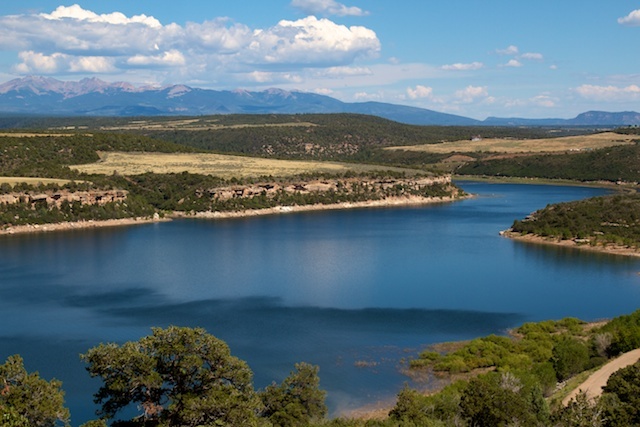 With the relatively short distances between the Four Corners and the San Juan Mountains, and lots to see and do, this is a great area to escape from the summer heat. 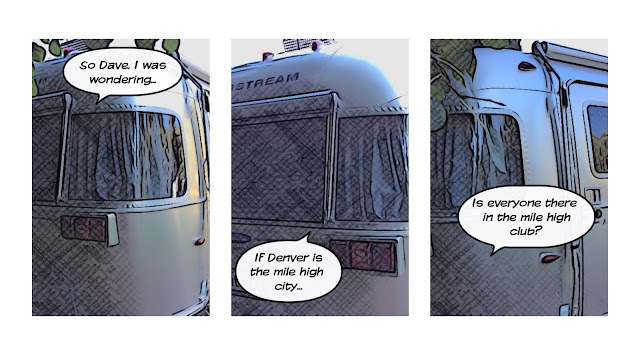 Looks like Dave needs his oil changed and we can get a spot at the James M Robb Colorado River State Park, so it’s back to Fruita and Grand Junction. Dave get’s his spa day: Oil change, injector cleaning and a new air filter. We get in a hike to The Devil’s Kitchen at the Colorado National Monument and then it’s back to Ridgway for more fun in the San Juans and beyond. 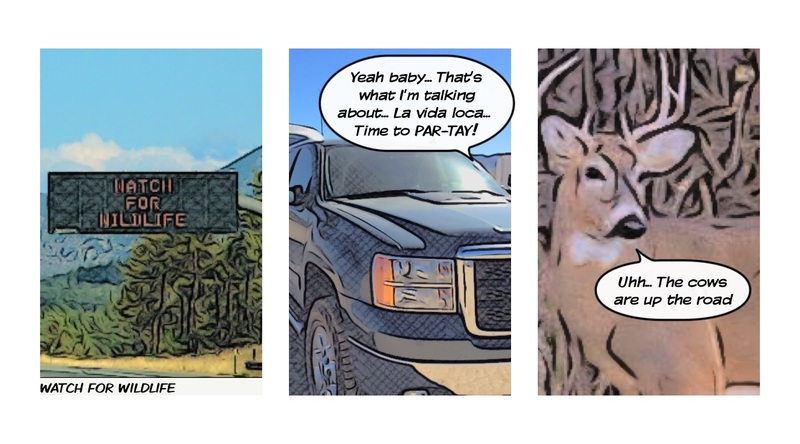 This week we’re at the Dakota Terrace Campgrounds at Ridgway State Park. We’re on top of the hill with lots of room and views down to the reservoir. There are water and electric hook-ups. No Sewer hook-ups at this campground, but there’s a Dump Station by the entrance. 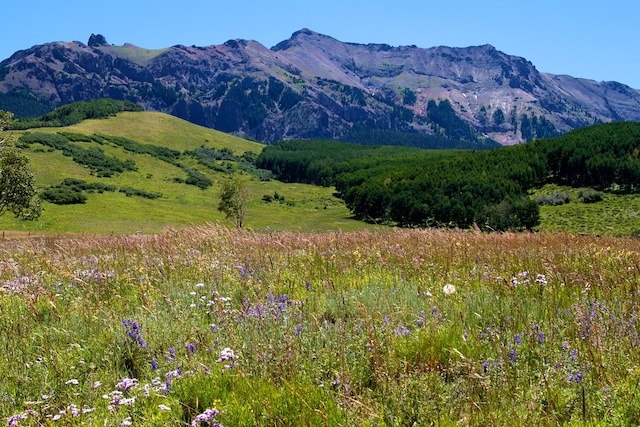 Owl Creek Pass began life as a cattle drive trail. – This “moderate” road heads into the heart of the Cimarron Mountains. It winds through ranchlands, along creeks and over high country meadows to the 10,114 ft. pass. Along the way we see pine and aspen forests, lakes and the peaks of Chimney Rock and Courthouse Monument. 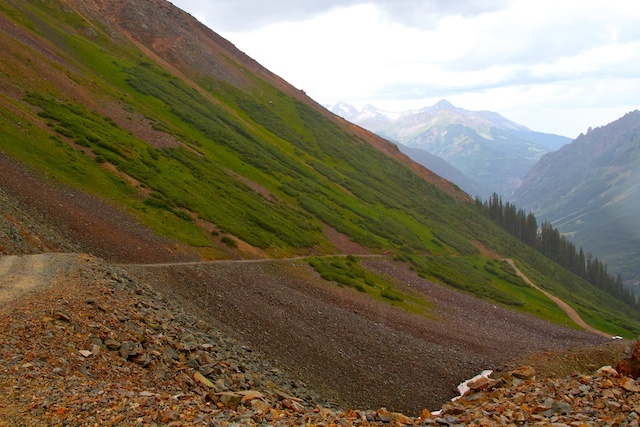 Last Dollar Road is classified “easy” and is one of 5 routes from the Ridgway/Ouray area to Telluride. We take this route after a series of thundershowers do Dave gets a mud bath. There are some great views of the San Juan Peaks and the Sneffels Range. Ophir Pass another moderate road, was established as a wagon road between mines. It starts as a gradual ascent winding through aspen forests and wildflower meadows to the 11,789 Summit. Immediately over the pass it’s a whole different movie. Here the trail is narrow and shelf-like and there’s one sharp switchback. After that it’s a beautiful ride to the bottom. The road to the Animas Forks ghost town follows an old railroad bed out of the town of Silverton. Silver was first discovered in Animas Forks in 1875. Harsh living conditions during the winter prompted the government to offer free lots and assistance with home building to early settlers and within a year the population boomed to 200 with 30 cabins, a post office, general store, hotel, two mills and a saloon. Unfortunately there was never enough silver to overcome the harsh conditions & the town eventually died. Today it's a popular stop. 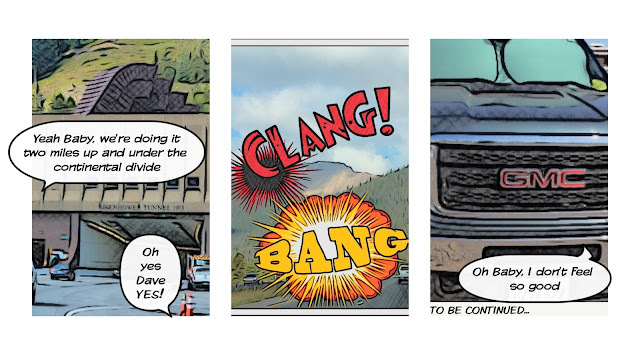 The Cinnamon Pass Road starts at Animas Forks. The day we visit, there is a line of Jeeps, Trucks and ATV’s winding up and down the road. It’s a bit too bumper-to-bumper so we pass on this pass. While we’re here visiting ghost towns and close mines it’s in the news. 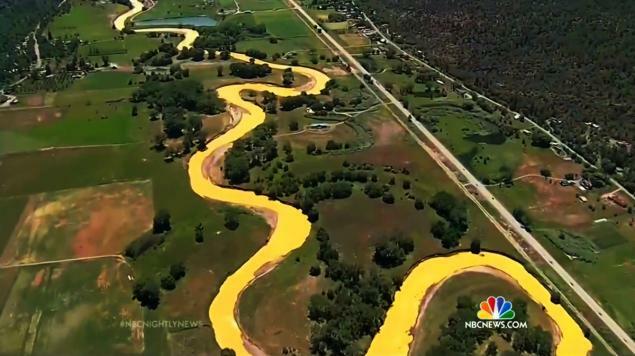 Seems that the Environmental Protection Agency, accidentally let 3 million gallons of heavy metal infused water from the Gold King Mine leak intothe Animas River. The polluted waters turned the river orange and flowed south into New Mexico, Arizona and ultimately into the Colorado River and on into the Sea of Cortez. This is one event at one closed mine. 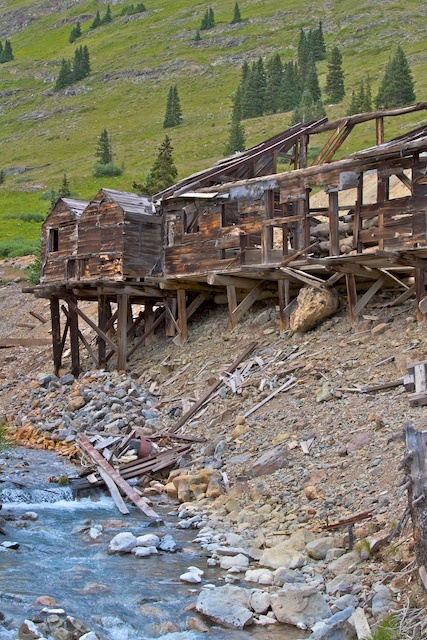 The Colorado Abandoned Mine Land program has inventoried over 2,800 abandoned mines on public lands. That’s a lot of pollution potential for the Western United States.